This one is so basic, yet everyone gets it wrong at some point. 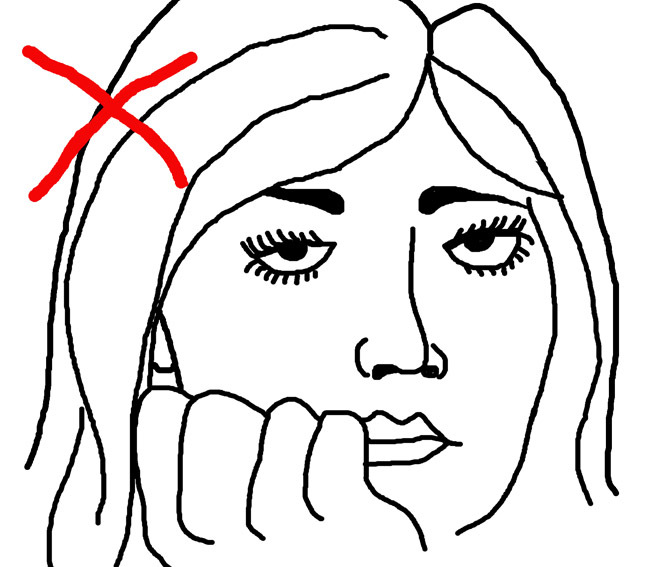 If you do get it wrong, make sure it’s not a crucial moment because you won’t live it down easily. It’s really simple, when the AD calls ‘quiet on set!’ it doesn’t mean keep your voice down, whisper quietly, but basically continue your conversation. Watch closely and you’ll see the sound dept inwardly screaming ‘For the love of God, NO!’. When the cast are rehearsing, getting direction, talking through the scene, etc. DON’T be chatting on about last night’s telly, or the latest instalment of that super-hero franchise you just can’t wait to see. Nobody cares, they just want you to shut up. ‘Quiet on set please!’ means ‘Everybody silent, NOW! Or else!’ DO respect that. I’ve been in the situation before on set where they have called for quiet, and another crew member has continued their conversation with me. I have blatantly ignored them until they have called ‘cut!’ I have also had to go and ask gangs of production assistants to shut up because they weren’t aware that walking 10 metres away from set wasn’t far enough to deaden their noise. If you want to get it very badly wrong, then DO exactly what I did on a film earlier this year. Thinking I was being discreet, I was playing a game on my phone to pass the time, whilst a poignant scene was being filmed. There was very little action in the scene being filmed in the next room (door open inbetween) so I knew no touch ups would be required, hence the phone game. 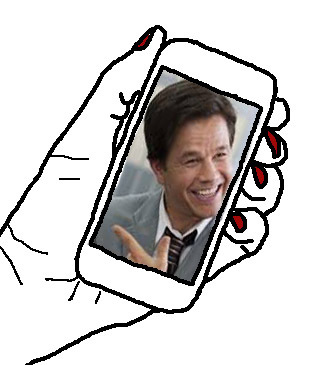 I don’t quite understand what happened next, but suddenly Marky Mark Wahlberg was loudly introducing himself and chatting to me from my phone. Obviously it was just an advert but the loud American accent didn’t quite fit the tone of the scene. 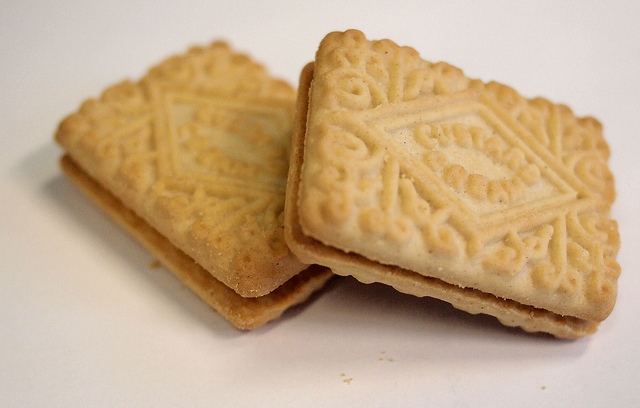 I badly messed up that time – had to buy the sound dept a packet of custard creams to say sorry. DO carry biscuits with you at all times on a film set. I’ve had quite a few students come along with me on film shoots over the years. I’ve also been on many film sets for work experience myself, both in make up and art depts. I don’t claim to be any sort of expert, but there have been a few occasions where I have found myself silently screaming ‘For the love of God, NO!’. Similarly, I have inwardly punched the air in triumph at other students actions. DO make yourself useful. Despite the fact that you are working for free, you’re not actually doing the film crew any favours. It’s the other way around in fact. The film crew can probably manage just fine without you and would probably save themselves time and money (transport, insurance, catering, expenses etc) by not having you there. No matter how long the hours may be, don’t moan, do join in, volunteer for little tasks and be proactive. I had one assistant complain about being asked to do touch ups. She felt her talents were being wasted. I didn’t ask her back. I had another refuse to stay at base to mind expensive pieces of kit whilst we went to set. Apparently it was too boring. I didn’t ask her back either. I had another student ignore my emails and text messages about the next days filming. It was the last time I asked her. DON’T act like you don’t want to be there. If you don’t want to be there, don’t be there. It’s that simple. I know I may sound like an unsympathetic grump who has forgotten what it’s like to be a student, but honestly I haven’t. I had another student, pretty recently in fact, phone me up on her days off to ask whether or not I needed her to come in. Although I didn’t need her in, it actually cost the production nothing for her to come in that day (she was in the area anyway) and so she came in. It was a quiet, easy days filming and so I was able to explain things to her in greater detail, she got to know the crew better and was asked back for several extra days. Everyone’s a winner! DO make yourself useful. Show willing and you will be given more responsibility. DO make sure people remember you for the right reasons (more to follow on this!) because the grapevine can make or break careers. 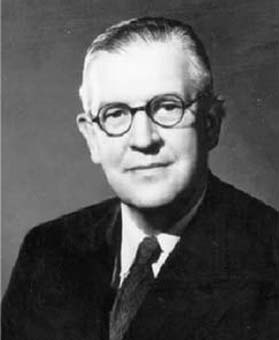 Sir Archibald McIndoe. A true hero. He inspired me to use make up to help people. After learning about him I joined Look Good Feel Better. I’ve decided to create a new category on here, of people who inspire me as a make up artist. When I decided to begin training as a make up artist, I was slightly concerned that it would be seen as a frivolous, vain career. Firstly, I wrong, nobody has ever thought that thankfully. Secondly, after learning about Archibald McIndoe I realised how important appearance can be to a person’s well-being. McIndoe was born in New Zealand but moved to the UK before the outbreak of WW2. He founded a centre for plastic surgery in East Grinstead at The Queen Victoria Hospital. At this stage, reconstructive surgery was in it’s infancy. During WW1 most soldiers who were badly burned would die. During WW2, advances in medicine meant the survival rate greatly increased. Unfortunately these RAF soldiers were now maimed and burned beyond recognition. 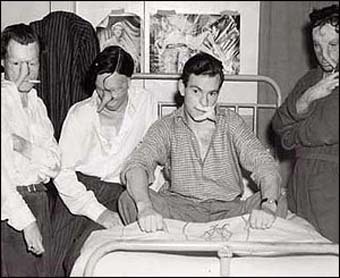 In order to improve their chances of recovery, McIndoe pioneered a new technique. For example, if a soldier has lost his nose and suffered scar tissue across his upper body, McIndoe would take a slice of skin from the patient leg, leaving it attached at one end. The loose end would be formed into a tube, which would be attached further up the body. Because it was still attached to the body, blood could flow through and the skin would be kept alive until it had a chance to ‘take’ at the other end. 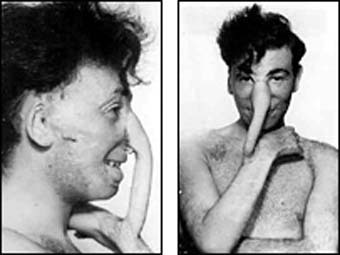 This process would be repeated until the skin was on the face ready to build a nose. This technique, though effective, was time consuming and meant that patients were left with these tubes around their body for months on end. Complimenting their medical treatment was the emotional support offered by McIndoe. He realised that the men were at risk of being seen as ‘freaks’ and so he encouraged them to mingle with their wider community in East Grinstead. Trips to the pub were arranged as were tea dances, where many patients met their future wives. Patients were encouraged to wear their own clothes or military uniform if they preferred, rather than hospital gowns and locals in East Grinstead were encouraged to invite the soldiers into their homes. Through this reintegration the soldiers were psychologically boosted and became a normal sight around East Grinstead, which came to be known as “the town that did not stare”. A drinking club was formed between the soldiers. 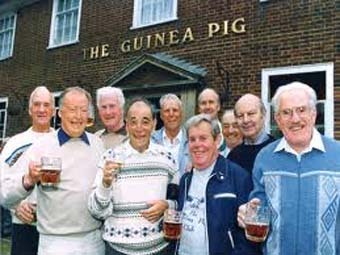 They called themselves the Guinea Pig Club in reference to their pioneering treatment and continued to meet annually in a pub in East Grinstead. By the end of the war there were 649 members, all helped by McIndoe, medically, emotionally and, in some cases, financially. Surviving members meet annually for drinks. McIndoe was knighted in 1947 and died in 1960, leaving behind a legacy of care. McIndoe understood that appearance was important to confidence and through his original techniques he treated the person, not just the wound. 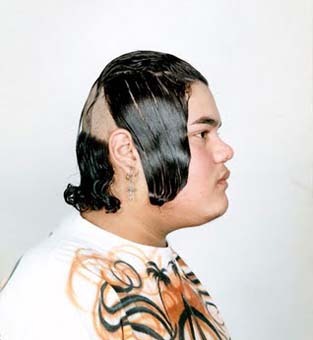 I think it was whilst training as a barber that I first became aware of the Cholombianos of Monterrey, Mexico. 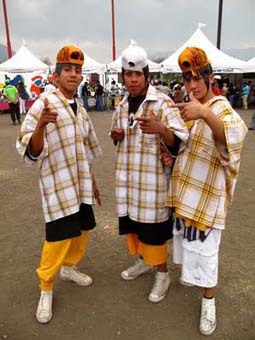 Like most youth sub-cultures, the Cholombianos are heavily influenced by music. In this case, specifically Colombian music, called cumbia or vallenato which has a chilled out, mellow vibe. In recent years Monterrey has suffered extreme violence at the hands of warring drug cartels. It is also generally viewed to be the most Americanised city in Mexico. Yet these are just young people trying to find their own style, that should surely be embraced. 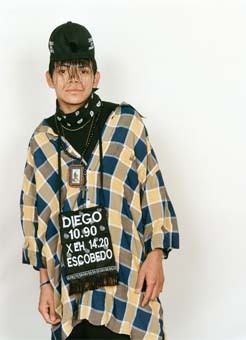 Fashions include baggy pants and plaid shirts (so far so normal – teens across the world wear similar clothes), but uniquely they also wear hand made signs around their necks bearing their name, their neighbourhood and their favourite radio station. I especially like the radio station bit, it’s like declaring that your musical taste is as integral to your identity as your own name. Then there’s the hair. Oh, the hair. I have honestly never seen anything like it. How good in this day and age to come up with a fashion that is truly unique. I’m not saying it’s to my particular taste, but I’m glad that the style exists. Plenty of gel to keep the sides in place. I’m digging the little flicks at the end! 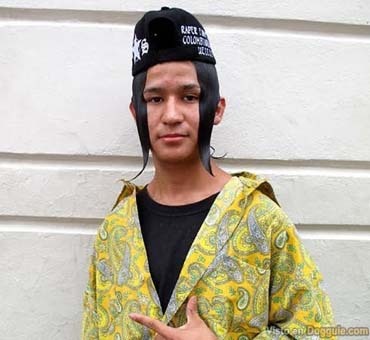 The general idea is to keep hair relatively short at the back and on top, but have long, gelled side pieces, often appearing glued to their faces. Yes, it’s easy to mock this style, especially when they all look so serious about it, but in reality these are non-violent peace-promoting kids who just want to listen to music and have a good time. Who cares how they look when they have the right attitude to life? * most of the pictures here are taken by Stefan Ruiz. He made a cool video about photographing them. You can watch it here. See the Cholombianos from about halfway in. 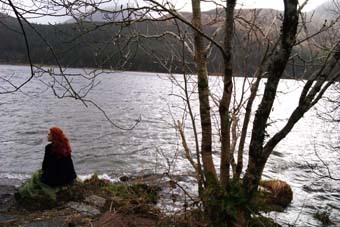 Beneath The Waters Of Llyn Coch is a fantasy story based on an old Welsh myth of The Fairy-Bride. It was filmed as part of a new series, Legends Of Old which will retell traditional myths and legends from around these fair isles. 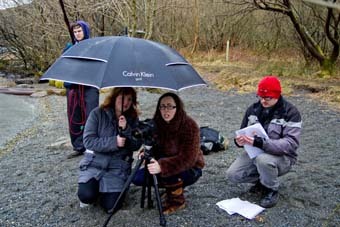 We filmed in the beautiful Welsh countryside near to Beddgelert in April 2013. Despite it being well into springtime, it was mighty cold! Apparently on the recce the lake was so calm and peaceful, unfortunately for us, when we came to film it, the wind was howling and the sky threatening. Ok, so it put back our schedule a little, but call-sheets will always be changed and there’s nothing anyone can do about the weather. In my opinion, it just made the lake seem a lot more atmospheric. 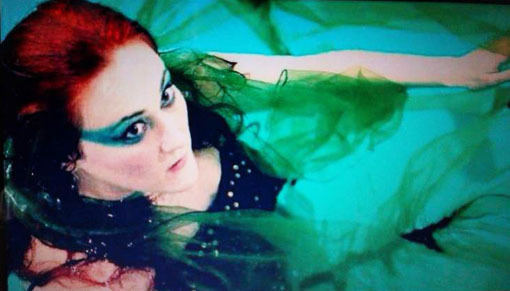 My biggest challenge on this film was definitely the underwater make up. Having never done this before, I did some research and tested a few products on myself way before the shoot so I knew I had the right stuff in my kit. Particularly useful was Illamasqua’s Liquid Metal palette, but we were also given a great selection of make up from MAC which proved very useful. Thankfully we had a great actress who managed to last several hours in the water without once rubbing her eyes. This made my job a whole lot easier. Nevertheless, the same make up had to be repeated time and time again, with weeks inbetween sometimes. It is for this reason I drum it into my students – take lots of pictures! They don’t have to be top quality, they don’t have to be beautifully framed, but they do need to show the details of the hair and make up. 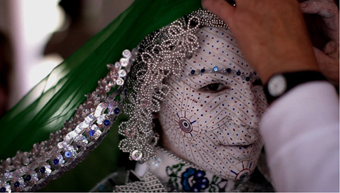 I’ve found quite a few pictures online of these beautiful Kosovar brides, yet there’s surprisingly little information available as to how and why the tradition started, what products they use and the specific designs used. For this reason, it’s hard to find too much to say. If you have any further information, please let me know! 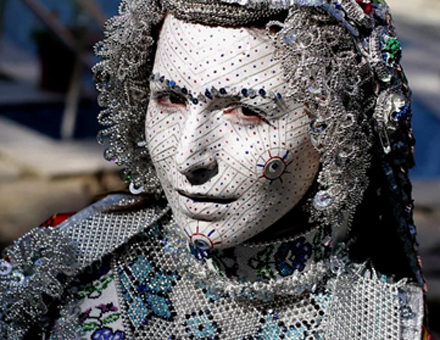 What is known is that this tradition is from the mountain town of Donje Ljubinje, situated in Kosovo, near to the Macedonian and Albanian borders. The people there are ethnically Terbesh/Torbesh Muslims (there are various spellings). The tradition is viewed with great pride by all the towns residents as it symbolizes their unique identity but sadly it seems this practise is dying out, being replaced by more ‘western’ traditions. This is the problem with globalisation, individuality is dying out. 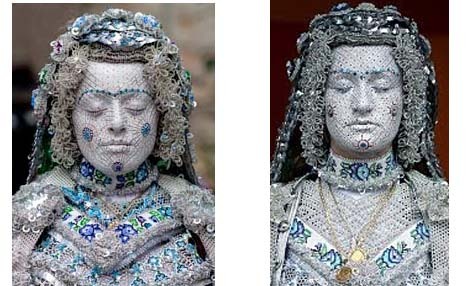 the ‘living doll’ make up is designed to ward off the evil eye. There’s a beautiful video I found online, which can be viewed here, showing the tradition. 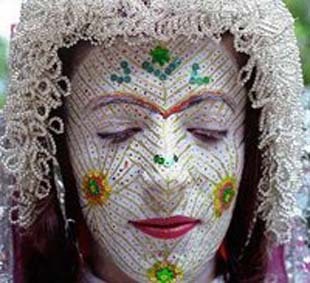 Apparently the make up artist looks so sad because she is the only one who still practises this art and is worried that the tradition will die. It will be a real tragedy if it does. In January I went a bit overboard in the Illamasqua sale. It’s hard not to really, their sales are always pretty generous and there’s some real gems to be found. 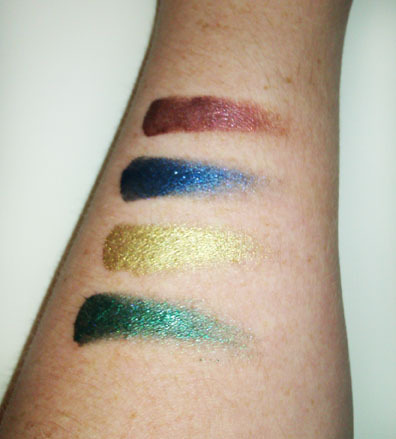 One of the things I was most excited about was a Liquid Metal Palette* containing 4 creams: stoic (green), solstice (gold), superior (blue) and resolute (red). I’m not generally a fan of cream eyeshadows, I’ve yet to be convinced that they’re as good as powders, however the pigments are so strong and beautiful in Illamasqua’s products and the price was so reasonable that it was too difficult to not buy it. I’d read other reviews whilst waiting for delivery and most of them said they found the creams pretty difficult to work with. Within minutes of application they crease in the eye socket and all your hard work blending and softening is ruined. How the colours look on skin – beautiful! I have to confess I had exactly the same troubles myself. And this is the crux of the matter. 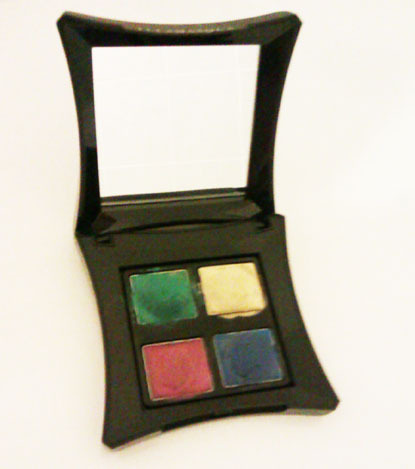 As pigmented, smooth and beautiful as these cream pigments are, they should not really be used alone on the eyes. Just as you would set a foundation with powder, these should also be set, with powder eyeshadow. This has 2 benefits. Firstly, the powder sets the cream minimising creasing and, secondly, the creams illuminate the powder, giving it a more 3-dimensional look. That’s not just sales patter there – it really does. 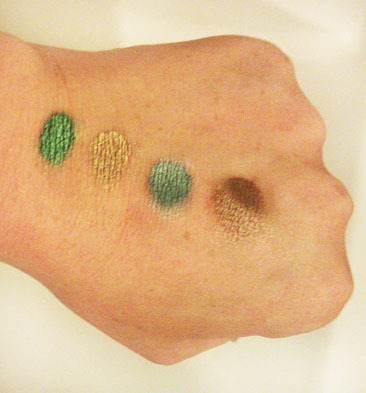 Go on, try layering different coloured eyeshadows over different creams. See? Much as I wanted to love this palette, I found myself putting it at the bottom of my kit and forgetting about it until…. I was asked to do an underwater photoshoot! ‘Excellent’ I thought, ‘another first for me.’ Second thoughts were, ‘Eeeek! 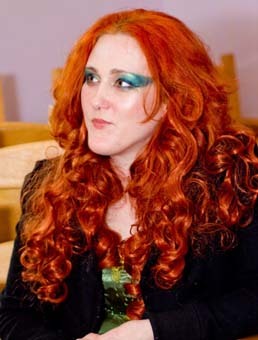 How am I going to do green fairy make up for underwater, that will last, be able to be replicated for future continuity (the shoot was part of a short film) and will also look good once the green fairy exits the water?’ And this is when my attention turned back to Liquid Metal. It’s great for underwater, stays in place, holds it’s pigment when all powders have washed away. I’d have been hard pushed to complete this film without it and for that alone, it was worth the investment. *Although the palette is now discontinued, individual Liquid Metal colours are still available.